We look back on a momentous year in Irish women’s soccer. 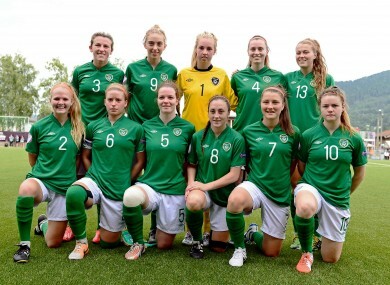 The Ireland under-19 women reached the semi-finals of the European Championships last summer. IN A TOURNAMENT that featured only eight teams, almost all of whom were footballing powerhouses, not much was expected of the Ireland under-19 women’s side at the European Championships in Norway last summer. With no real past footballing pedigree and facing the prospect of coming up against the daunting likes of England, Spain and Holland, some might be forgiven for expecting a repeat of their male counterparts’ dismal Euro 2012 failure — in which Giovanni Trapattoni’s side lost all three matches — to be on the cards. Yet Dave Connell’s team were never going to be content with simply reaching this prestigious stage. “It’ll definitely be one of my most memorable experiences,” one of the team’s stars, Ciara O’Connell, tells TheScore.ie. “I think I’ve learned a great deal from it and I’ll look back on it with great pride. Given that the Irish team were the clear underdogs ahead of the tournament, O’Connell feels this status (or lack thereof) worked to their advantage to some degree, and believes other sides viewed the Girls in Green with a sense of complacency, enabling them to capitalise by picking up consecutive wins over Spain, England and Sweden. There have been plenty of similarly talented Irish women’s underage sides in the past, but few have come close to matching the achievements of O’Connell and co. She cites the increased emphasis on fitness within the set-up, as well as the fantastic team spirit, as being pivotal to their success. “The whole team had a great bond off the pitch and I do think that translated onto the pitch. The work that Dave Connell and [his assistant] Dave Bell put in was phenomenal — trying to ingrain the whole idea of work rate, not leaving anything on the pitch, [ensuring] every teammate works hard for each other. It’s definitely stepped up from previous years. “We’ve always had talented players, but trying to put all the ingredients together and have a functioning unit that worked really well together [was tough]. A growing sense of confidence within the side following some notable pre-tournament results saw them continue this success in Norway. “It’s always nice to beat the English because of the rivalry between the two nations, but especially coming from 1-0 down, we made a few changes in the game. Yet the Irish team’s incredible success ultimately ended in disappointment, as they suffered an emphatic 4-0 loss to the Netherlands at the semi-final stage. O’Connell cites exhaustion and the overwhelmingly hot conditions as two reasons for their sudden loss of form against a team they had previously drawn with during the qualification stage. “I’d never experienced playing in the kind of heat that Norway had,” she says. “Just before the Swedish game, the temperature at its peak was 37 degrees on an Astroturf pitch, which the heat radiates off. “After playing three tough games, we were mentally tired coming into the last game. We did have a gameplan, and maybe with an extra day recovery, we could have performed better. The Ireland under-19s’ success made national news back home, and O’Connell says the team sensed the support for them mounting as they increasingly exceeded expectations. “We definitely did notice the step up in support from home. On social media, we were getting so much praise, and there was a lot of coverage. Of course, particularly when it comes to women’s sport, there is a sense that this type of mass support tends to be fleeting, and is only reserved for those rare occasions when a team enjoys unprecedented levels of success. Does the fact that the team are only fully backed on a sporadic basis frustrate O’Connell? “We know women tend to take the backseat in sport. We’re here to play football rather than to play around with Twitter or Facebook. We’re international players and there’s a job we have to do. We don’t take too much notice of it, but it’s a good thing to have the support there. O’Connell has now completed her Leaving Cert (despite having to reschedule one of her Oral exams owing to her exploits with the Irish under-19s). She is currently studying nutritional science and has a Quercus Scholarship at UCC. In addition to continuing to represent her club, Wilton United, she is hoping to feature for the Irish Colleges team at the World University Games. Furthermore, as part of her scholarship, O’Connell has sat down with former Irish rugby coach and current Director of Sport and Physical Activity at UCC, Declan Kidney, to discuss her goals. She consequently hopes to some day break into the Senior Irish Women’s team, though says this process is likely be “gradual” if it does occur. O’Connell also admits she misses being able to represent the under-19s now that she’s over the age limit, and particularly owing to the lack of an under-21 team to further bridge the gap between youth and senior level. Under-19s manager, Dave Connell, seems less nostalgic, explaining that he prefers to focus on the future rather than dwelling on past successes. “This summer’s campaign was a massive overachievement by the young girls,” he says. “To beat three countries — for the resources and player pool we have — was astonishing. So that batch of players worked very hard — we knew they were talented and that they could turn games for us. Despite possessing players, such as Megan Connolly and Savannah McCarthy, who were part of the team’s summer success and still eligible to play thereafter, Connell cites lack of squad depth as the primary reason for their subsequent failure. Speaking of which, Connell also coaches the under-17 Ireland Women’s team, and unlike their elder counterparts, they have managed to reach the elite phase of qualification. However, progress is far from a certainty, as having beaten Lithuania and Romania and tied with hosts Serbia to earn a place in the elite stage, the Irish were subsequently drawn in a tough group, and are set to face Holland, England and Hungary. The games will be played between April 9-14, with the Irish team being handed home advantage for these encounters. “We don’t have the player pool that each of the other countries have and we don’t have their financial backing, but we just have to work with what we have,” he says. Connell also is planning on bringing in some of the successful under-19s players from the summer to help their younger counterparts ahead of these vital games. The former League of Ireland player emphasises the big step up, not just from youth to senior level, but also from 17s to 19s. Moreover, he highlights the Irish under-17s team from 2010 — who reached the World Cup quarter-finals — as a cautionary tale more than anything else. “An awful lot happens between 17s and 19s… Over the years, we’ve had a big dropout. It’s just circumstances with the girls — they’re young kids who are suddenly young adults. They’re going to college, there’s an awful lot happening. And does he sympathise with the difficulties of players such as O’Connell, who are left in limbo to an extent with no under-21s, once their term with the under-19s ends? “Ciara is one of those players that’s very talented,” he says. “She may not go straight into the senior side, but there’s certainly room for an under-21s or a B international team, or whatever the case may be. “Again, it all comes down to finances, which we don’t have. Sue [Ronan, the senior team manager] will probably tell you that there’s a big difference between 19s and senior. It’s going to take an exceptional player to do it straight away — Denise O’Sullivan and Megan Campbell have done it, but very few have. It’s probably going to take a few years. Meanwhile, one player who featured for the under-19s in the summer, and who appears to be making enormous strides, as highlighted by her starring role in Raheny United’s FAI Cup final win (see below), is Katie McCabe. And unsurprisingly, Connell believes McCabe has the potential to go far in the game. “I was at the game and there was no doubt it was a stunning goal. They’re the kind of things that Katie can do. She’s hugely talented and a very skilful player. She still has an awful lot of things in her locker. So with the talented likes of McCable leading the way, is Connell optimistic that Irish women’s football can continue go from strength to strength, whereby occasions such as the success of last summer start to become the norm rather than the exception? “I’m optimistic, but we can only work with what we have. Obviously, the development of the game at a younger age is vital and that’s what we intend to do. Email “‘The other teams obviously thought nothing of us’ – Revisiting the Ireland U19s’ historic success”. Feedback on “‘The other teams obviously thought nothing of us’ – Revisiting the Ireland U19s’ historic success”.